This "well-sailed yacht" has a long history as a California native. JADA was designed by Judson Kelly as a long distance ocean racer and built at Stephens Brothers Shipyard in Stockton, California. She was lunched June 5th, 1938. She was commissioned as a graduation gift for Jack from his parents Alta and Delbert Axelson. The name JADA is an acronym comprising the first letters of their names. JADA was homeported for her first 23 years at Newport Beach Harbor. Originally rigged as a staysail schooner, her length overall was 65 feet, with a narrow beam of only 11 feet, and a draft of 9 feet. The cast iron keels for JADA and Odyssey, another local yacht, were poured and machined by the Axelson Manufacturing Co. at Huntington Park. They were loaded onto a flatbed railroad car and shipped to Stockton. The hulls of JADA and Odyssey were almost identical; and were built concurrently. JADA was rigged as a stay sail schooner, Odyssey became a yawl. Each was owned by a Huntington Park industrialist. Odyssey by commissioned by Harry Steele of U.S. Electric Motors. The yachts were actively raced and sailed along the coast from Santa Barbara to Ensenada, Mexico. On September 25th, 1939, JADA was moored alongside the Axelson family pier on South Bay Front. “El Cordonazo”, the only tropical storm to make landfall in California in the 20th century, caused much damage at Newport Harbor. The wind increased in velocity so quickly that Jack was unable to get JADA off the lee shore float. Jack and his crew spent the night arranging fenders and shoring up the pilings to prevent damage to JADA. The fierce wind subsided at daylight and JADA came through the storm with no major damage. JADA was frequently involved in many social events with the Newport Harbor Yacht Club during this time. Celebrity visitors on JADA included Humphrey Bogart, Lauren Bacall, Errol Flynn, John Wayne and Broadway star John Raitt (father of singer Bonnie Raitt). More recently in San Diego; Tom Cruise, Nicole Kidman and Louis CK enjoyed relaxing with their families, away from the fans. If the bulkheads could talk! In 1950, Jack Axelson reluctantly sold JADA to Mrs. Isabelle Belyea. It has been said that Belyea purchased JADA so that her daughter’s boyfriend could sail to Honolulu in the 1951 TransPac race from California to Hawaii. JADA placed 10th in class B and 18th in the overall fleet. In 1953, George R. Sturgis of the Newport Harbor Yacht Club acquired JADA. 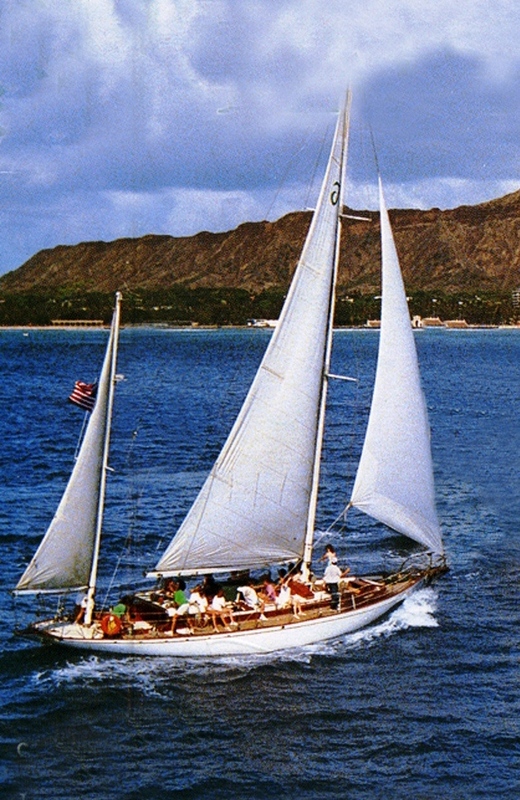 The schooner rig did not fare well in downwind yacht races, so in 1955 JADA’s rig was converted to a yawl. This allowed for a much larger spinnaker forward, and a large mizzen staysail increased effectiveness on downwind runs. Under Sturgis’ ownership, JADA was actively raced in local regattas and competed in five TransPac races, twice taking home the 2nd place overall trophy. JADA was sold to Howard Wright of Los Angeles Yacht Club in 1961 and she ceased to consider Newport Harbor her homeport, while still continuing her racing career. In 1969, JADA was first overall in the Tahiti Race. There are unconfirmed reports that JADA may have been purchased by Marlon Brando, where he enjoyed her for several years in French Polynesia. It’s much more likely that the actor was a frequent visitor. JADA was purchased and operated by Classic Yacht Charters in 1992, and moved to Honolulu Hawaii for charter service. This was the beginning of her commercial career. She was relocated to San Diego in 1996, where she was a star nautical attraction at the Republican National Convention, hosting events for party members and guests. JADA continued to sail in and around San Diego for the next two decades. After extensive renovations, JADA is currently owned by Carole Noska dba Sail JADA Charters LLC. JADA is berthed at the Sheraton San Diego Hotel and Marina on Harbor Island. She is actively offering private charters to corporate and social groups and public charters for whale watching, sunset and afternoon bay sails.